So a mixed day for England, who will be delighted to have seen their captain get a long-awaited century but not quite so thrilled with the overall complexion of the day, which definitely belonged to West Indies. Plenty of work to do tomorrow when they resume at 240-7. Join us for live text of the second day at 14:25 BST. Until then, adios. "West Indies bowled better, but England played some poor shots. Bell's shot was a shocker, Root got himself without overconfidence. I think England could have done better, and the game is definitely moving on, If England can get 280 or 290, that's something to bowl at." Michael Blighe: The Cook doubters need to appreciate this ton for what it is. Mental grittiness and a much needed morale boost! Nice one Chef! Sam: Not sure I've ever celebrated a century as emphatically as that, and what a time for a captain's innings. "Trott had a great Test record before his illness but since his comeback he's on the move before the bowler lets the ball go. If you do that to pace bowlers and it's short of a length you are in serious difficulties. You don't have time to react and you are in no-man's land. "All the bowlers have seen that, especially the Australian fast bowlers, and they will be licking their chops." England all-rounder Moeen Ali on Sky Sports: "Once I played 30-40 balls I felt quite comfortable, it was just a shame I got run out again. Cooky hit it but I didn't think there was a run, but I trusted the call. It's great for him to get a hundred, it was a shame he got out at the end. We probably lost two too many wickets but we've still got batsmen and hopefully we can get to 350. "I'm looking forward to bowling on there tomorrow, or hopefully the day after!" "Cook made two mistakes only. He ran Moeen Ali out, he hit it hard straight to the fielder and I don't think Usain Bolt would have made it. I thought Moeen himself batted very well - he did it when England were under pressure and they've got England to a reasonable total." Former England spinner Shaun Udal: Very pleased for Captain Cook on his 100. Apart from anything else you'll never meet a nicer man, EVER. "Cook has played splendidly, he's been good for the team to bat all day when wickets have been going throughout day. "I watched his feet, he was going back and forward and above all he played straight. He fully deserved his hundred. In Tests, he's not been in that bad form, we've got confused because he was struggling in one-day cricket. With concentration, patience and footwork like that he will always make runs in Test cricket." Alastair Cook can't believe what he's done. He's slumped on his bat handle, he doesn't want to go, but he has to. With five balls to survive before the close, he tries to cut Marlon Samuels and gets an under-edge to Denesh Ramdin. That's the end of the day, and make no mistake, it's West Indies' day. England in a pickle. "This is why I love Test cricket because it separates the sheep from the goats." Andy Donley: That has to be my favourite sporting moment of 2015 so far. Hopefully the start of another special year for Cook. Ollie Kemp: I've seen many hundreds in my time but enjoyed none as much as that. Well done Cooky, and welcome back! Now, the emotion of that Cook hundred shouldn't disguise the fact that this has been a mixed day for England, especially with that wicket of Ben Stokes. They'll be desperate to get through to the close without further losses. Holder keeps Buttler on 0 with a maiden. "It was one of the better hundreds I've seen. That is how you score hundreds in Test cricket, by playing straight in the v to start." Becky Davies: Think all England cricket fans just simultaneously cheered and breathed a sigh of relief! Pete Hotchkiss: I SO hope that's the start of Cook finding some serious runs again now. A great knock from Cook, who has stood tall while others around him have crumbled today - and really it was no more than he deserved after a rich vein of recent form in which he has appeared to rediscover his famed powers of concentration. "It's Cook's fifth Test century v West Indies and second at this ground following a century here in 2009. "Coming from 259 balls, it also equals his slowest Test century - the century he made against Pakistan." "Think of the journey Cook has been on and he's answered it with a wonderful performance for England." It's there! Alastair Cook lets out a scream of jubilation as he finally ends his two-year long century drought. Not since May 2013 have we seen him raise his bat for three figures but he's done it again, century number 26 for England. He gets a ball on his legs from Gabriel, clips it through midwicket and suddenly all the frustrations of the past two years melt away. "Cook has batted so well today. I've been impressed by his technique. He's defended a lot and has looked solid. Like a wall." Firas: The moment you see the 6th wicket go and you're begging it's not Ali Cook. Jos Buttler comes to the crease with his skipper two away from a restorative hundred. He's like your perennially unlucky-in-love sister, Alastair Cook - sure we roll our eyes and have the occasional chuckle at his trials and tribulations, but deep down we all want to see him find happiness again, don't we? He's just one run away now after a clip to square leg. Somebody protect the Kensington Oval lockers. Ben Stokes has perished to a silly dismissal, back-cutting Shannon Gabriel straight into the hands of Shai Hope at gully. "The trouble with Jason Holder is he is not really quick. You need at least two bowlers who bowl quick, that is what wins you Test matches." Nick Hall: Oh Alastair! I'm hiding from the scores more often. What an effort under that pressure. I can see a high scoring summer. Dan Wright: Dear cricketing world, the moment you feared is here. Ali Cook closing in on a century. Oh, be afraid... Come on England! I know Alastair Cook divides opinion but surely you can't begrudge the skipper a ton here after the past two years. He gets a little closer to his ton with a single to mid-off. "Cook has got his feet moving well and he has played with authority. I would be happy for him if he scores a hundred." Eleanor Cunningham: Tense music from the Bourne Ultimatum on TV gathering pace as Cook nears his century...coincidence? "A pretty even day at the Kensington Oval. I think if the West Indies get another one they will be up but an easy paced pitch I must say." Stokes climbs into Jason Holder and belts him over midwicket for four. The fair-skinned all-rounder looks like he could do with a liberal application of aftersun after the close of play, but in terms of temperament he's anything but frazzled out there. Peter Collins: Cook could carry his bat for a team score of 400 and still not get his century... but at least he's getting confidence! Shannon Gabriel, who has been remarkably under-utilised today since he claimed the wicket of Jonathan Trott this morning, finally returns to the attack to share the new ball. Cook continues his sedate march towards three figures by helping him round the corner for a single. Richard Johnson: Is this the equivalent of safety play in snooker? The West Indies elect to take the new ball immediately. This morning's destroyer-in-chief Jason Holder gets the cherry. Stokes cleverly glides him down to third man for four. Cook and Stokes milk a single each off Permaul, and the new ball is available. Samuels, who has outbowled Permaul today without ever really looking like taking a wicket, scoots through another over for the loss of two singles. last Test century came in the second innings of England's 247-run win against New Zealand at Lord's in May 2013. He put on 72 for the first wicket with Nick Compton, who contributed just seven from 85 balls in what was his last Test match. The skipper then put on 130 with Jonathan Trott, batting at three, before falling to Kane Williamson for 130. Incidentally, a certain Graeme Swann took figures of 10-132 to be named man of the match. Veerasammy Permaul is back. Does his return mean West Indies are thinking of taking the new ball in three overs? Looking at Jason Holder getting loose, you might well think so. Permaul has an unfortunate habit of throwing in a four-ball every over and there's another one, sitting up short and begging to be swept to the square leg boundary. Captain Cook duly obliges. "In a Test match you should be naturally more cautious than in one-day games because there is not the need for runs. If there was a slight risk why would you run on the first day of a Test match?" I can't remember the last time I looked up and Marlon Samuels wasn't bowling. He's performing a holding role for Denesh Ramdin and you'd have to say from that point of view he's done a decent job. Cook moves into the 80s with a whip through midwicket. The DJ at the Kensington Oval is indeed making a superb racket. He's got red headphones and gold decks. Outstanding. Back out in the middle, Ben Stokes gets lucky when he props forward tentatively at a length ball from Jerome Taylor and is lucky to see it fly between second and third slip on the bounce. I thought we'd had drinks earlier but I must have been mistaken because we're having them now. England batting coach Mark Ramprakash: Had to laugh as Ben Stokes asked for his guard but the umpire couldn't hear as the music is seriously loud!! Stokes punches Samuels out to deep cover for a single. No sign of their hostilities bubbling over...yet. "There was never a run for Moeen's dismissal. Even if it's the captain calling you for a run you just say no and send him back." Darth Ashes: Chef barbecues Moeen! Sunday Times cricket correspondent Simon Wilde: Moeen deserves a posthumous VC for carrying on with that single. The arrival of Ben Stokes has woken the West Indies fielders up - there's more chirp than an aviary of galahs out there at the moment. Stokes keeps the strike with a single off the last ball of Taylor's over. Rachel T: Whoopsie. Well, I think that's what Cook just said. Blonde Bear: Selfish run-out caused by Cook. Likely to cloud his mind and stop the elusive century? "Moeen Ali is the 10th England player to be run out in consecutive innings... the first since Monty Panesar in 2008." Ben Stokes is the new man, on a ground where he once broke his hand punching a locker in frustration. He's off the mark against his old adversary Marlon Samuels with a back-foot punch to cover. "England have to carry on the same way. It may not be to some people's liking, not scoring quickly, but I think it has been fascinating cricket." We took drinks immediately after that wicket, where replays showed Alastair Cook putting his palm to his face and chuntering away to himself in frustration. A horrible feeling, that. But can he put it out of his mind and go on to get his long-awaited century? He's lucky not to get an edge behind when Taylor beats him all ends up with an absolute doozy that just moves away off the seam. "Backward point is back about five or six yards deeper than normal. Cook hit it straight to the fielder's right hand and I think Moeen had given up." Oh skipper, what have you done? Alastair Cook has thrown Moeen Ali to the wolves here. The captain taps Marlon Samuels straight to point and inexplicably calls Moeen through for the run. It's a doomed effort for Moeen, he's never getting there, like a man sprinting down the railway station steps as the last train pulls out. On the balcony, Peter Moores runs his hand over his head in frustration. "I don't think I have seen Alastair Cook play as well for a while. His footwork and playing straight towards mid-off, rather than cover and square cover, has been exemplary." Cook inches determinedly towards his longed-for hundred with a two to extra cover. Jimbo: Permaul's action is like a man trying and failing to get out of a jumper that doesn't fit him. It hardly helps ease the sense of enervation that Marlon Samuels is perhaps the world's most languid bowler - a man so relaxed that you half expect him to break off in his delivery stride to stifle a yawn, or light a big cigar. He manages to resist that urge for now as he sends down an over that yields one more single for Alastair Cook. Finally, we're going to have a bit of pace. Jerome Taylor is the man who has been summoned to deliver it. He bowled too wide earlier today but he starts off a little straighter in this spell. Moeen plays out a watchful maiden. Nick Hall: Scared to look and listen. Switch off for one hour then see how the Captain is going. A phenomenal century if he can convert. Not much happening for West Indies here, just going through the motions. Moeen takes a single off Samuels. Si Lomas: These last couple of hours captaincy from Ramdin has been shocking, completely let game drift and handed initiative to England. England are taking control here. Moeen drives Permaul to deep cover for three more. "Once again the West Indies are letting a very good position slip. It happens so frequently. Permaul has leaked runs." Moeen and Cook continue to add runs to the score with the casual ease of a shopper adding groceries to the trolley. Moeen goes to the treats aisle and helps himself to a big six with a slog-sweep off Samuels that takes him to his fifty. now available as a podcast. Well worth a listen - he's quite a character. "Ramdin as a captain can't afford to let Permaul bowl with this field. He has to get him bowling fuller so he can get the batsman driving. They have to be more attacking." Permaul has gone at over four an over today - he just hasn't been able to stem the flow of runs, a real black mark for a front-line spinner. He gifts Cook another boundary with a short and wide ball that is dispatched to the point fence. "Keep going, Marly," Denesh Ramdin chirps as Marlon Samuels sends down another non-event over. Look Denesh, Marlon can keep going, but the rest of us are slightly losing the will here. Kindly put a fast bowler on, would you? Ed Stockton: I think boxing is possibly the only sport less appropriate than cricket to hear Taylor Swift playing over the tannoy. It's all pretty easy for England at the moment against this spin duo. Moeen and Cook milk a couple more singles off Permaul. More from Samuels, a bowler who really ought to be only occasionally called on as a novelty, but instead has been inexplicably overused, like rectangular plates in restaurants. Moeen dots a single out to deep cover. Permaul continues. He really does have an extraordinary action, a frantic blur of flailing arms and elbows, like a magician trying to escape from a straitjacket. He's not been entirely accurate today either, too many short balls, and he's lucky that Moeen only pulls his latest freebie for a single. I must say I'm rather confused by the use of Samuels after tea, and indeed throughout today - he's now sent down twice as many overs as Shannon Gabriel, who bowled beautifully this morning. Moeen gets three with a slightly mistimed drive through the covers. Harry Cunningham: The last thing we need is a Cook century against this second rate attack to paper over the cracks until the Aussies destroy him. Rob Meech: Does anyone else yearn for the days of Vaughan and Trescothick getting us off to a rapid start? This is so sedate. Spin from both ends as Veerasammy Permaul takes the ball from the other end. Again, Cook takes a single into the covers and Moeen blocks out the rest of the over. Deja vu. Cook is immediately up and running with a single to deep cover. Moeen blocks out the rest of the over. Now we have all manner of statistics for you regarding Alastair Cook and the pursuit of three figures but we shall not burden the skipper further for now, and let's hand over to James Gheerbrant to describe the final session. "I think England are in a fairly decent place to be on this pitch. I don't think it's a 500 pitch, I think it's a 350 pitch. The dismissal of Joe Root was very disappointing though." "I like the way Moeen has played. He's come out and played really refreshingly." Moeen is certainly my favourite modern day England player but no-one bats as beautifully as David Gower in my opinion Graeme. Cook runs Permaul down to third man for a solitary single. We've had 31 overs in the session, 80 runs have been scored and just the one wicket lost. A better session for England. "Moeen bats like a bearded David Gower. The England management are trying to fast-forward this bowling, but his batting has always been his strong suit." Gabriel tests Moeen with a well directed short ball that is well defended, but then blots his copybook by erring down the leg-side and Moeen helps it to the boundary. A clever, well-pitched up final ball tempts Moeen to drive but there is no contact. Time for one more over before tea. Jim Rusling: It's great to hear Tino Best - I've known he was a great guy since my 48th birthday when West Indies had a warm up match v Sri Lanka A at Shenley. He had an aggressive reputation which was totally dispelled by an elderly gentleman who told me that he had been in the nets asking his 8- and 10-year-old grandsons to bowl to give him net practice. Later when the West Indies team were using the pitch for practice the players and management reluctantly allowed me (barefoot) to bowl one ball at Mr. B.C. Lara. What a birthday! The fifty partnership arrives from 133 balls, the first time this pair have batted together in a Test match, as Cook flicks Permaul neatly away for two more. Mike France: Amazed at the low percentage of balls that would hit the stumps. Is it a modern thing? What is wrong with "they miss, I hit"? Lots of increasingly reddening skin amongst the large English contingent but they will be happy with this burgeoning partnership between the two contrasting left-handers. Just the single to Cook from the final ball of Gabriel's over. "Permaul looks as if he just rushes things a little bit. He's bowling two or three poor balls an over. He just needs to slow himself down and concentrate on his release." The lively Permaul bustles in again but Moeen is not going to miss out on the opportunity to increase the run rate, hoisting the spinner for two boundaries over the leg-side field. Martin in Kent: Enjoying listening to the commentary on TMS and the insight from 'Mind them Windows' Tino! My cricket club Teston (in Kent) is due to be playing Lashings on 5 June to officially open our new pavilion! We understand Tino may be playing. The windows are double glazed so hopefully not in danger! Gabriel sweating up in the paddock but it's another maiden and he's been economical, just the one boundary coming from his bowling so far. James in Sevenoaks: Go on Cooky, let's go and convert into a big one now, so we will only be debating about one opening spot for the New Zealand/Australia summer. First Ed Sheeran and then Adele on the PA system, it's not just West Indian fast bowlers that have disappeared, where's the reggae? Another fluent cover drive from Moeen with that expansive backlift of his sends Holder to the boundary, the fourth he has conceded thus far. "If these two can just hold themselves together and make solid runs until tea, you just sense that the tenor of the body language will balance out a bit. But if you make a mistake and go into tea five down, the dynamic changes." Big Gabriel only bowled four overs before lunch but he's back. The rate had improved to 14 per hour but it will go down again now. Not the most attacking of fields as he bowls his first delivery to Moeen, there is a man on the mid-wicket boundary. There is an appeal for caught behind as the ball nips back and slips between Cook's bat and pad but nothing doing. Beth Jakubowski: Alastair Cook, proving people wrong in his quiet unassuming way since 1984. Form is temporary, class is permanent. "Alastair Cook has now reached 50 66 times in Test cricket, which equals the most 50+ scores by an English batsman, alongside Graham Gooch." The lesser spotted Adil Rashid is in his hi-vis tabard sitting near the boundary. Did he have a beard before the tour started? he's got one now. The fact that this pitch has already started to take spin on day one will not have done much for his well-being. Patience from Moeen, leaving Holder's tempting deliveries outside the off-stump and the big West Indian is spoken to by umpire Bowden for running too close to the 'business area' in his follow through. "Alastair Cook once again has shown that he's an extraordinarily resilient character. He's looking more and more like he's put his bad form behind him." Cook clips Samuels for two to record his fifty from 139 minutes, his sixth in his last nine innings and the 41st of his distinguished career. Now for that elusive 26th Test century. "I haven't quite made my mind up about Moeen. At times I see him bat and bowl and I think there's something there, but I'm not convinced. He's not under any pressure because we're so short of decent spinners in England. He likes to drive the ball but he's going to have to be selective about it." Moeen finds the right ball from Holder this time and plays a sumptuous cover drive which bisects the fielders and races to the boundary, the left-hander's third four. Fraser: Ali and Stokes can't be in the same side, they're both handy 5th bowlers and inventive batters. Pick one depending on the pitch. Chris Parker: I'm glad we won't be batting last on this track, it'll be turning at right angles come day 4 and 5. So we had 19 overs in the first hour of this session, England adding 44 for the loss of Joe Root. Mercurial Marlon continues, so the rate will stay in a healthy state. The Windies bring in a man at silly point under the helmet to add to the solitary slip, there is a little turn away from the left-handed Cook, who plays out another maiden and remains one short of his half century. "Alastair Cook has played beautifully today. He's played a real opening batsman's role, sealing off one end. He's left the ball very well and looked solid while everything's been going on around him." Holder continues to dangle to carrot outside Moeen's off-stump, and with a cover drive as good as his, one gets the feeling that the stylish left-hander is itching to have a dash at one. The loss of those four wickets are ensuring he remains patient for now. Time for drinks. Tom in New Jersey: My main irritation with England's selection policy is that there seems to be a really sharp divide between those in England's plans and those who aren't. For instance, if Chris Jordan has an absolute shocker against New Zealand, he may miss the first few Ashes Tests, but he'll be back by the end of the year. Whereas, you feel that Boyd Rankin could take 80 wickets this year but not get back in the side because he's "had his chance". Outside the line of off-stump and umpire's call for the stumps, so the Windies lose one review and umpire Oxenford is delighted to signal no change to the original not out decision. The Windies ask for a referral as Moeen pushes forward to Samuels and the ball hits pad first. "I think Holder is bowling a little too short. I'd let him bowl a touch fuller and get a gully in. If he keeps bowling back of a length he's going to make it easy for Cook." I had to make sure what that was on that hat before publishing the picture. Headgear is definitely advisable today though as the sun continues to beat down. A change of pace as the accurate, if only medium fast, Holder returns. The final ball is short and wide but Cook's cut finds the fielder and the fifty will have to wait. Holder's second maiden. Leigh Matthews: If Captain Cook doesn't convert this into a century I will parade through my street starkers, and put the video on Twitter. Where did that spin come from Marlon? It was like a Shane Warne googly. It looked to have taken a piece out of the pitch too as it fizzed up and past the outside edge of Moeen's bat. The end of the 40th over and we are almost back on schedule thanks to these two slow bowlers. Just the single to Cook who moves within three of his half century. Another maiden from Samuels, as much for the batsmen not wanting to get out as anything else. That bowling action is far from classical shall we say. The England captain is still going for his shots, however, one top edged sweep off Permaul lands safely for two, but another is out of the middle of the bat and brings him a seventh boundary. Ralph Brooker: Recovering from an operation (liver out) and am on a drab diet for two months. Have been ordered to stop smoking (three weeks now). Loving the cricket as always but the inevitable foody references (liquorice allsorts) get me salivating. I'm dreading buffet bowling and, above all, the throwing of pies when the left-armer comes on. Could we come up with a metaphor with less calories and protein in it, please! Samuels is rattling through them, and Cook, who has gone 35 innings without a Test century, calmly plays out a maiden. The England 100 comes up in the 36th over as Moeen clubs Permaul into the leg-side for a boundary, the seventh conceded by the slow left-armer. "Samuels is an underrated bowler. He's done a good job for the West Indies in several Test matches, and he's doing a good job here now." Samuels is performing a useful role here, he is quickening up the over rate. He has taken 38 Test wickets in his 58 matches with a best of 4-13 but surely here there would have to be some alarming errors of judgement for him to improve on those figures? England selectors have announced that Yorkshire's Adil Rashid and Durham's Mark Wood will complete England's 13-man squad for the one-day international against Ireland next Friday in Dublin. Leg-spinner Rashid and fast bowler Wood will return home early from the West Indies to join up with the rest of the England ODI squad. Ben: Even for the form he was in Root was due a soft dismissal. The others need to step up now. Beth: Such a stupid dismissal. Didn't try to hit it and just dangled the bat. Not what you would expect from a man in form. Permaul sends down another full bunger to release the pressure, although it was delightfully struck through the covers for four by Moeen. Not the most confident of starts for Moeen Ali either, trapped on the pad by Permaul, but when Samuels returns to the attack with his innocuous looking non turning off breaks from round the wicket, both left-handers are determined to get fully forward and not make any mistakes. "It's a real throwaway. It was short and wide from the spinner, Joe Root has just really lazily dangled the bat, he's not even tried to hit it, he's just tried to run it down. For man in such form, that's lazy." Oh Joe. That was very un-Root like, it was an airy waft off the back foot to a short one that turned and it feathered an edge to a jubilant, and astonished, wicketkeeper-captain behind the timbers. No world record-equalling seventh score of fifty plus for the young Yorkshireman. Is Cook's luck beginning to change? He is due. His cut shot brings him four but it is off the inside edge narrowly past the stumps and the fifty partnership arrives from 83 balls. Jamie Morgan: Does anyone else think Trott went out to the WI to help Cook believe he wasn't the worst player in the team? It's worked wonders. James Gutteridge: Some beautiful leaves in this innings so far. Total cricket. Some liquorice allsorts from Permaul, some sharp spin wide of off-stump but two full tosses that are both confidently swept to the boundary by Root, closing in on this world record of successive scores in excess of 50. The Prince of Wales in Fleet are in attendance, or some of their patrons anyway, according to one St George's flag. Taylor is up around 90mph again but no problems for Cook, who is content to play out a maiden, the eighth of the innings. "Alex Hales has 639 runs so far this season - the second most runs ever before the end of April." Lots of movement in Permaul's action, nothing like Paul Adams, but all manner of twisting, wriggling parts. Not much spin yet though and all fairly comfortable for the two well set batsmen. Luke Howles: If England decide to drop Trott, it would be a complete injustice to not select Adam Lyth. Just the single from that Permaul over but with two slips and a gully in for Taylor, the purposeful Root clips the paceman for two off his pads, and is then alert to deflect one away when a defensive shot threatens to spin back towards the stumps. Olly Rex: Hales' upturn in form in First Class cricket has coincided with a move to number three. Maybe a Test match player, but no opener. "I think what we are going to see from Permaul is a few rubbish ones but he has got a good ball in him, he puts a lot of revs on it." Callum Johnstone: Re Pat (16:53) I have tickets to Lord's fourth day against NZ and I'm already planning what to do in the afternoon! It won't be in NW8! The diminutive left-arm spinner Permaul, who should really have had Cook caught for 22, will resume after lunch. The result of our vote is in and it is fairly clear that the man you want to open the innings for England is Yorkshire left-hander Adam Lyth, who has polled 57.1%. The current incumbent, poor old Trotty, only mustered 2.9%. Mike Ball: Anyone else think England should open with Hales and Lyth against New Zealand? Cook 3, Ballance 4, Root 5. Pretty good top 5. Thanks JG. Still time to vote in our England opener poll on the right hand side of your screens. I always thought young Joe would be at the top of the order for years in the mould of Michael Atherton, but he seems to be very happy at four, and often gets to the crease very early in the innings in any case. Right, time for me to leave you and hand you back to Jamie Lillywhite for the afternoon session. Jay: I don't understand where the urge to ruin a non-opener's confidence by sending him to open comes from. Just get Lyth in. Gareth Sweet: Hales has started the season in sensational form and should get the nod to replace Trott for the New Zealand Tests. Tim Chesworth: Nick Compton should be given another chance to open. Didn't really do a lot to deserve being dropped when he was in the team. Over lunch, TMS will be interviewing musician, entrepreneur and chef - and former Dragons's Den contestant - Levi Roots. You can listen to that right now. Who should open for England? As you will hopefully be able to see on the right side of your page, or in your 'Vote' tab if you're reading on mobile, we've created a vote for you. We're asking you who should be opening with Alastair Cook when England take on New Zealand later this month: should it be Jonathan Trott, Adam Lyth, Alex Hales, Gary Ballance or someone else entirely? Take your pick, and we'll publish the results in half an hour or so. So, with England three wickets down, you'd have to say that's West Indies' session. They've bowled with decent pace and it's Jason Holder, who was carried off the field in the last Test match, who has done most of the damage. The headline news of that session from England's point of view was a third duck of the series for Jonathan Trott, whose place in the side now looks very precarious. Gary Ballance suffered a disappointingly early exit for a man with plenty of runs under his belt recently, but Alastair Cook and Joe Root show every sign of continuing their good form and it is they who will be charged with rebuilding the England innings after lunch. "Outside of Jimmy Anderson's spell in the last match this has been the best cricket of the series for me. West Indies have come out and done something they haven't been able to, they have bowled some really good balls at pace and made England struggle. "Trott can't open the batting like that, if you're moving forward to pace you're in trouble, and Bell's was a 'gimme' wicket. But Cook has played beautifully, his judgement, footwork. Joe Root looks a man possessed with confidence and form." Taylor appears to be deliberately bowling well wide of the off stump at Cook today, dangling the carrot under the England batsman's nose. But Cook, an abstemious opener at his best, is just letting them go at the moment, resisting temptation. So Taylor straightens up and Cook flicks him off his toes down to the fine-leg fence. And with that, we lunch. Aashish: Agree with 16:49 John Fryer - how the third umpire couldn't see the fingers under the ball and lack of dust is beyond me - poor. "There is a disenchantment with their own team from West Indies supporters. They still talk cricket but because their team has been weak they talk with so much disappointment. Here they have had some of the greatest names in world cricket but now they think where's the Marshall and the Garner, Greenidge and Haynes? Now they say, we haven't got anybody, Geoffrey." More from Permaul, who was perhaps unlucky in his last over. The Guyanese left-armer - coming round the wicket to Root - just gets a little straight and the England batsman sweeps him fine for four. Then he drops far too short and Root skips back in his crease and clobbers him down to the mid-on boundary. Jim: On the train home from Cardiff. No more wickets before Crewe please. Only at Cwmbran. Denesh Ramdin turns back to paceman Jerome Taylor before lunch. Taylor is sporting a neat little pointy goatee today - the kind of beard you mould yourself out of suds in a bubble bath. Or at least I do. It's fairly wayward stuff from the Jamaican bowler, until he gets one straighter and it fizzes millimetres past Cook's forward push. A maiden. Martin in London: I'd give my left kidney for Cook to knock a ton now. A swaying ship needs a captain to steady her. And immediately Cook takes advantage of his good fortune by sweeping Permaul powerfully for four. John Fryer: That was out, Cook should be gone, sorry. Third-umpire fans will know how this one goes: a few grainy shots of the ball entering the hands in close proximity to the ground, before the inevitable 'not out' verdict. I tell you what though, I think Cook is lucky here - that looked to me like it bounced off the splayed fingers off Shai Hope at short leg and wet straight into his hands. but the England captain gets the benefit of the doubt. "I was doubtful that it carried. If I was Cook, I'd be standing too, I wouldn't be going for that." Charlie Rhodes: Really solid innings from Cook whilst wickets fall around him. He looks in control. Root just needs more of the same! Gary Zielosko: If Cook is going to get a century with any man at the other end, it'll be Joe Root, he brings so much calm to the middle. A bit flaky in the head, Geoffrey? I think there's a shampoo you can get for that. Root whips Samuels into the leg side for a brisk two to bring up the England 50. "They should get another slip in. If they get another wicket before lunch on a flat wicket on a lovely sunny day? 'Wow' you'd say. Bell's dismissal was poor, sometimes you think he is a bit flaky in the head." Root's arrival at the crease has tended to have the effect of a strong double-shot espresso on the usually slumbering England innings throughout this series and he's quickly into the energiser act here. He times a poor ball from Holder off his legs to the midwicket boundary, and then wakes Alastair Cook up with a very sharp single to mid-off. Huw Braithwaite: One positive to take from this: can't remember the last time England were three down this early and Cook was still at the crease! "Root reminds me of Steve Waugh, maybe Mark Waugh too. He looks like he has a lot of time and that is the hallmark of a very good player." Samuels continues, jaws chomping away lazily on a stick of gum as ever. Root, who has tended to start busily in what's been a remarkable personal series, is off the mark with a nudge off the pads. Sanj: Looks like it has to be Joe Root to the rescue again! The Australia pace attack is going to murder our line-up in the summer. Elliott Bewley: England are obviously just flying through their order to give Joe Root time to pick up a double ton. "If Root gets another fifty here he equals the world record of seven in succession." What better man to come to the crease with England in a spot of bother than Joe Root, arguably the form batsman in world cricket at the moment. Surely he can steady the ship? Tell you what though, he's not far away from getting a tickle on an attempted dab from another sharp Holder delivery. England are wobbling now. Ian Bell tries to drive Jason Holder back down the ground but is into the shot too early and the 6ft 7 Holder snakes out one of his long tentacles to snaffle the return catch. Bell tears off his helmet in disgust. With a new batsman at the crease, surely now is the time to bring back one of the West Indies seamers at the other end. Nope, it's Marlon Samuels to continue for the moment, waddling gingerly to the crease and sending down six balls that Alastair Cook dead-bats away quite nonchalantly. "West Indies in a fantastic position but they would really like one more wicket before lunch." Richard M: Stuart Broad would have reviewed that. Ian Bell is the new man. "Holder has to be smart and be patient bowling on flat wickets and that was beautifully bowled. The West Indies needed that wicket because bowling at Cook and Ballance late in the afternoon they would be scoring hundreds. Holder has the height and I think he has the heart, he just has to stay focused and keep working on his game." This is the kind of dismissal that satisfies a fast bowler's most primal instincts. Fast and straight from Holder, it beats Gary Ballance for pace and swing, hurries through the gate like a postman pursued by a particularly fierce Alsatian, and wallops into the top of off stump so hard it breaks it in two. Comprehensive. 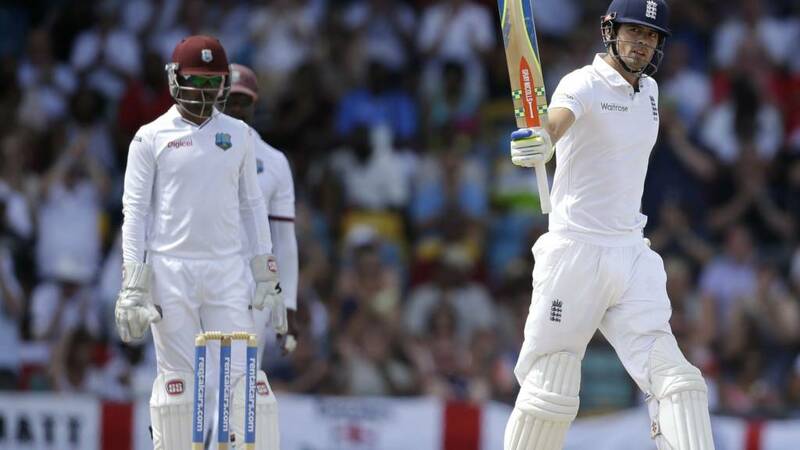 Holder roars in delight., England two down. Marlon Samuels looks pretty mean and moody in his dark shades and super-tight, pec-hugging shirt but his bowling in this series has been decidedly toothless. Too short, too slow and Gary Ballance ups the tempo with a thumping cut for four and a huge, strong-armed six over deep-midwicket. "Holder has to be a batting all-rounder who will be a third or fourth seamer, because he's not going to get the five-fors like a fit Kemar Roach would do." Jason Holder was stretchered off in apparent agony in the last Test - we thought we might not be seeing him again for many months but here he is fit and firing. Cook, who has advanced sedately this morning, picks up four with a confident cut through point. "When Ballance walks out to bat in the second or third over, with his natural game - his back-and-across, his stillness - he looks adept as an opening batsman." Jamie, thank you. Some old-school drinks being taken there - no bottles of fluorescent isotonic beverage for the West Indies, just a woman with a jug of water and a stack of polystyrene cups. Marlon Samuels to continue with his leisurely off-spin - there's a bit of turn too, just getting one to squirt off the outer edge of Gary Ballance's bat, but it flies safe. A nice square drive from Ballance off Holder brings him two. Just the 12 overs then in that first hour and let's hope the energy drinks quicken things up. Over to James Gheerbrant to take you through until lunch. Sergeant Major Marlon Samuels makes it a double change. Even if there are no salutes today, he will provide some much needed impetus for the over-rate with his run/amble-up of three paces.